the hull is built up in wood and painted with a dark red bottom, black waterline, white topsides and an applied gold cove stripe, the planked decks of basswood veneer detailed with bow chocks, winches, deck hatches, ventilator, coils of rope, life ring, spinnaker pole, skylights, companionway, binnacle, ship's wheel, traveler and dory at stern. 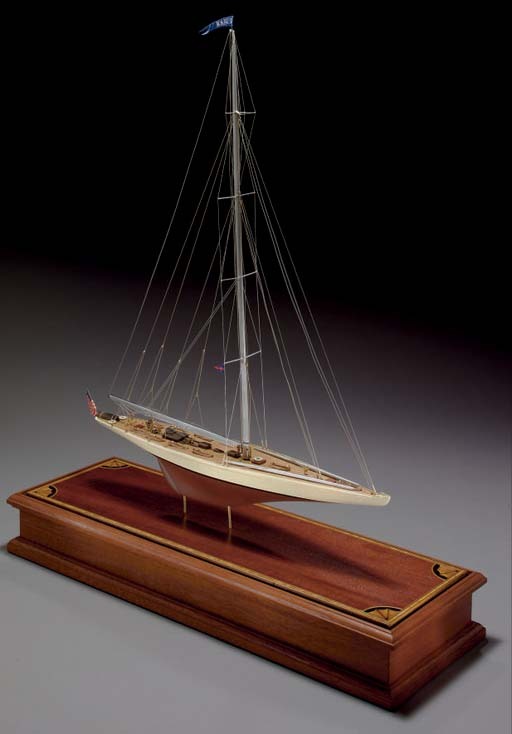 Rigged as a sloop with a single mast and boom, standing and running rigging, turning blocks, spreaders and other rigging details. Mounted on a pair of brass pins within a mahogany case decorated with inlays on the base with a glass cover withbrass trim.